How do people really communicate and share ideas with each other? Researchers conduct lots of surveys. Experts share their “best-practices”. However, until now, it’s all been basically a little observation and a lot of extrapolation. Best performers use their networks differently than the average. They maintain stronger engagement with people (to be able to reach out to them more quickly) and with a diverse set of people (customers, competitors, and managers). People who are energetic create more engaging interactive conversations, producing more idea flow. Ideas flow easier when there’s transparency to seeing what others are doing. Ideas flow better when there are a wide number of unique inputs. It’s dangerous for everyone to use the same inputs and come to the same conclusion (a potential for media control, for example). There’s a wide disparity between what people answer in surveys (what they think) and how they truly act. People are aware of their goals, but often aren’t aware of their actions. 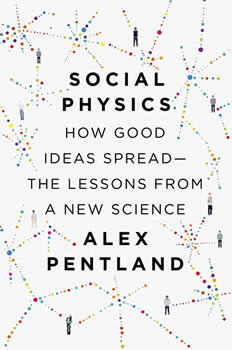 People rely upon social learning (it’s easier to see others doing something) more than self-learning. “Common sense” is based on a community’s idea flow (shared, integrated habits, and beliefs). Engagement (cooperatively working together) requires direct, strong, positive interactions between people. Social ties are keys to influencing. Weak online ties don’t create engagement. Stronger engagement also improves productivity. To improve an organization, don’t just reward the “winners”. Reward those that helped the winners, and those that helped the helpers, etc. It gives everyone a vested stake in the outcome. By having better data available for all, we can make better decisions. But instead of having the data in the hands of corporations (as we do today), we need individual ownership of data and granular control of what we share with others.